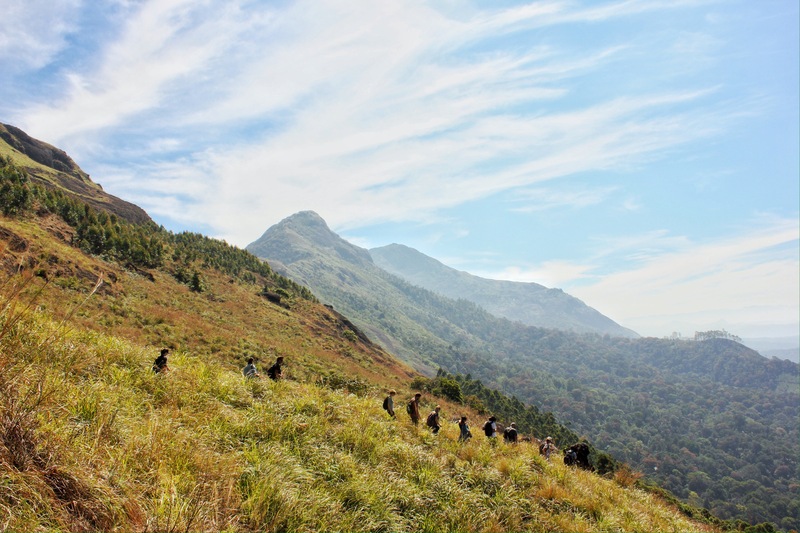 The trip to Munnar is easier if you’re in an air-conditioned tourist bus. The local bus is much cheaper, but you don’t have air conditioning; you’re smudged in with people, livestock, and packages; you won’t have outlets for charging your phone; it takes a LOT longer; and it offers no advantages from a scenic point of view. 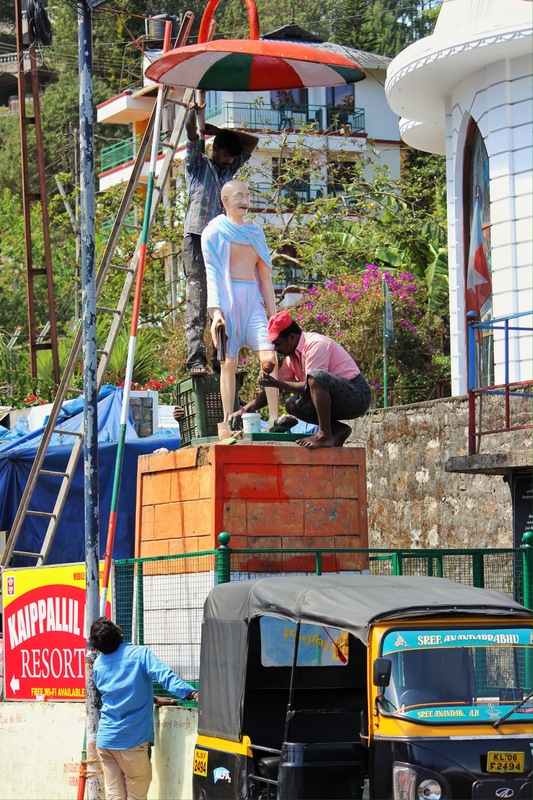 On either bus, you start out in Kochin, in the suburbs, with everything chaotic and bumpy and amazing, everything you expect from India at this point in your trip. The bus will climb slowly through the lowland hills, which are dense with jungle plants and people, and, every few miles, a town, densely populated. Sometimes you look up the town names on your phone, and it turns out the town name was given 3,000 years ago by a prince who was hunting deer, for example; the town means “Place where the deer was hit by an arrow shot by the prince” or “place where the deer fell” (which are a few miles apart from each other). When you do learn the name, and how old the town is, you look at the buildings – ancient already, by Western standards – and wonder how many hundreds of generations have lived on these winding streets, if the people shopping at the market stalls or washing the front of the school with a hose and rags can count their ancestors back to the men who helped that prince hunt the deer, or shared in its roasted flesh, and then you get to a bus station in the middle, and a man waves at you from a vegetable stand, and you wave back, and his co-worker waves, and you wave, and suddenly an entire store has come out, waving, and you laugh, and you wonder if India is the friendliest place you’ve ever been, because the four men waving know that your bus won’t stop for you to shop there; they just want to make some sort of contact with you. As the market towns and deer killing towns thin out, you cross plains full of workers, feeding the country. 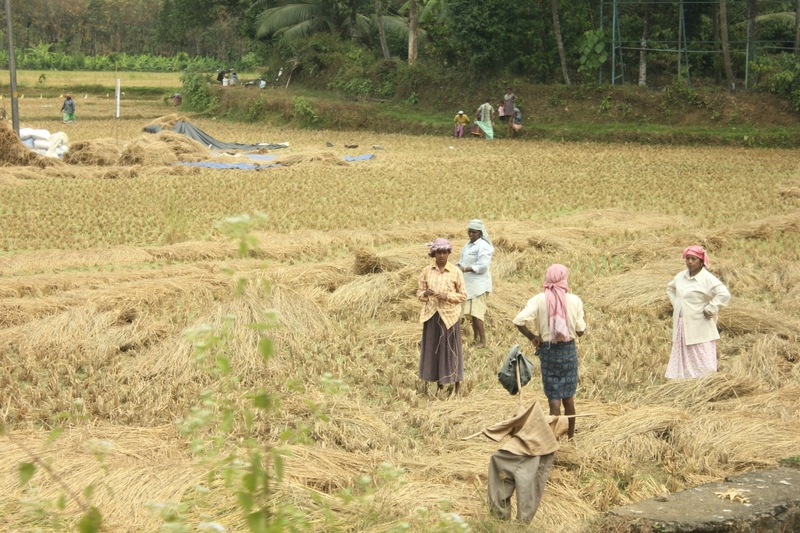 It’s perhaps a sunny day, so they’re making hay, and you again think of how many of their generations have done the same thing, with some of the same tools, mostly their hands, and you worry about what an inevitable industrial revolution might mean for all of those workers. Sure, it will “free” them up to work in factories, or shops, and they might earn more money, but at what cost? Will it mean that they can afford mobile phones, computers, and meat more than once a month? New clothes? Scooters, then, eventually, after a few generations, cars? But you realize that you have started the ascent up through the mountains, where you slice through jungle, cross bridges over lazy sacred rivers, and bus-brush tree branches and Kiplingesque vines before getting to the fields of tea. As beautiful as they are, at first your nose turns up. 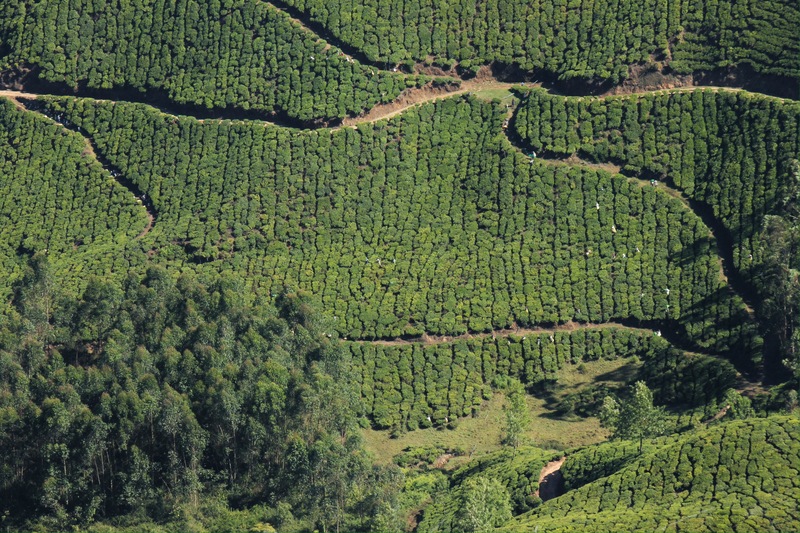 These tea fields aren’t as picturesque as those in Sri Lanka, and are littered with far more trash. 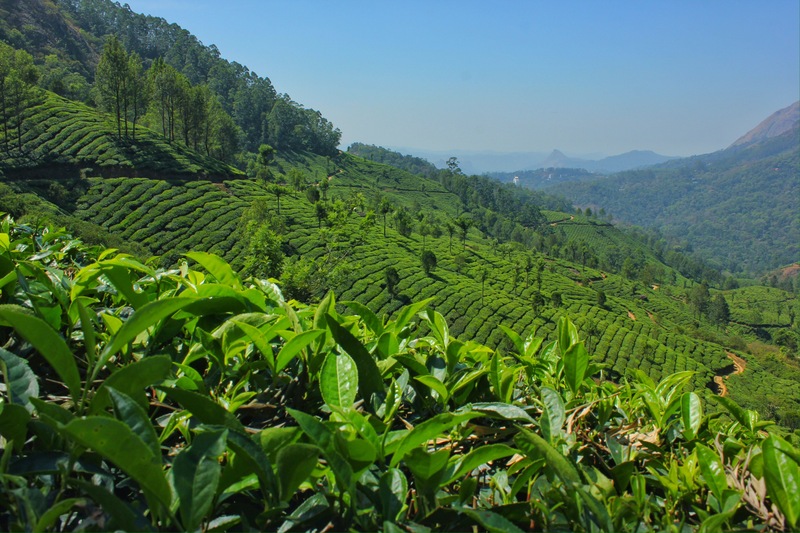 In Sri Lanka, the tea plantations were immaculately maintained, and the only way to get there was by a winding, one-lane road, with a private driver and car, and there weren’t pedestrians for miles. When you stepped out of the car in Sri Lanka, you were surrounded by calm, and an almost unnatural silence, broken on occasion by a bell swinging from the neck of a cow, or a cockerel call, and when the clouds approached you, they didn’t approach to block out the sky, but they came in to block out everything you could see, because you were so high up that you were eye-level with them. But here, there’s a two-lane road, and honking, and people walking and looking at maps with plastic bags at their feet, and cans and bottles crunching under your tires, and you wonder if you’re just going to be let down by the whole area. 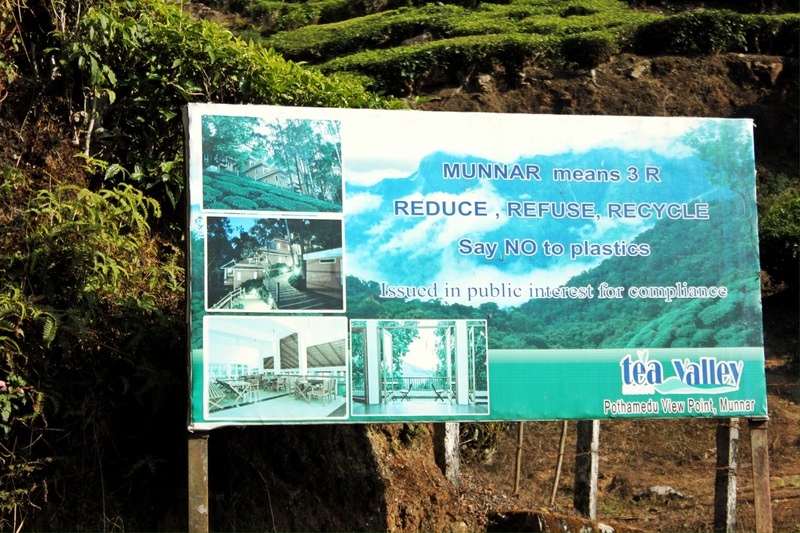 The plastic is especially jarring considering the emphasis Munnar puts on the Three Rs: Reduce, Refuse, Recycle. At first, you think that this means they had just misspelled the English phrase, but then you realise they’d updated it: “Refuse to use plastic.” Plastic bags are apparently a relatively new phenomenon in many countries, but have already become a hazard, since people toss them to the side of the road or burn them in rubbish piles (the most common ways to get rid of household waste). Later, you might learn that most people don’t know that plastic doesn’t decompose, so they don’t realize the effects that plastic has on nature. 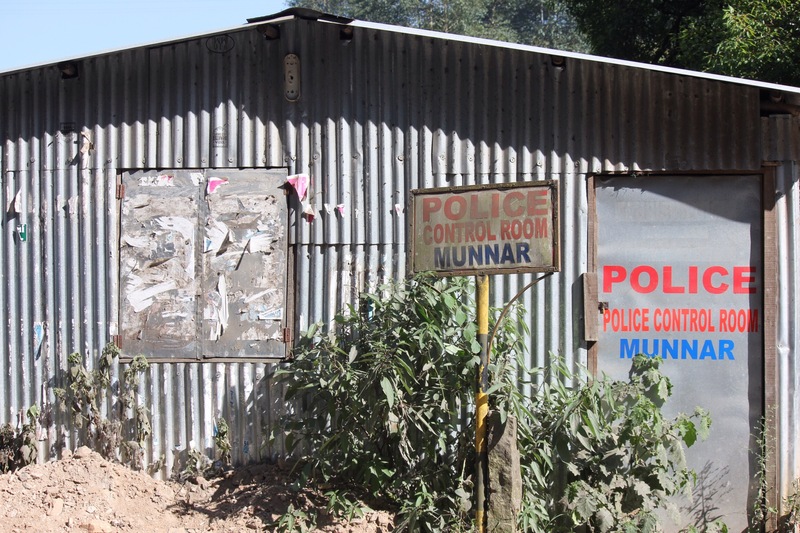 Munnar is ahead of the game, but evidence indicates it still has a long way to go to get people to act on what they know. Entering the city of Munnar feels as if you’re entering a Wild West town; the river is lined with small shacks built of castoff boards; the forest branches seems to be attacking the town like a guerilla army, only being held back by some immense defensive force of activity; and the few streets are packed with people and shops, all of which abruptly end after a few hundred meters. There are postal worker barracks, ATMs, and a dark liquor store that always seems to have a line out the door; it sells obscure brands of Scotch you’ve never heard of, with labels made by people who clearly weren’t native English speakers, and probably weren’t overly familiar with any other British languages, either. Walking up the street toward the Ghandi statue, making a right, and crossing the pedestrian bridge will bring you to what might be the town’s finest restaurant, Mohammed’s. It was the best place we found for hot sweet tea, biryani, tandoori chicken, curry…well, to eat and drink, period. The waiters are all extremely welcoming and hospitable, and speak English shyly, as if they were kindergarteners meeting a person of some importance, like a teenage cousin. One of the waiters has a long, deep scar on his arm that you will look at every time he walks by. Stay as long as you want, but if the restaurant gets busy, don’t be surprised when a lone Indian man sits down, orders, and stares at you with curiosity while he is waiting for his food. Most of the good hotels are a few kilometres out of town, deep into the tea plantations. The ones in town seem to be like Wild West inns – transient places, built for utility rather than comfort, with innkeepers who care about payment and check-out time rather than customer service. I’d recommend the Eagle Mountain Hotel. It’s a $2 tuk-tuk ride from town, and the ride takes almost 30 minutes, through winding roads lined by tea bushes. 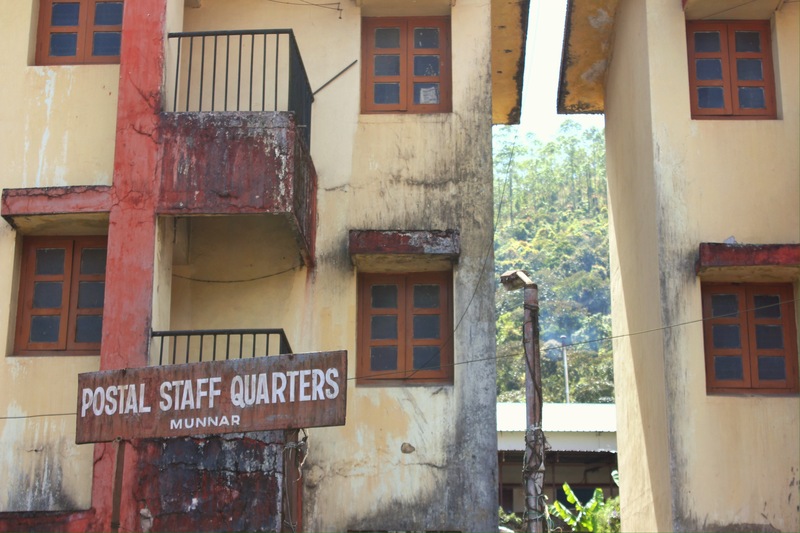 Eventually, when you think you couldn’t be in a more rural location, you’re deposited in a small outpost of buildings, one of which is the hotel. The manager is young, with a giant smile, and everyone is extremely eager to please, even if they don’t always get your food order right. 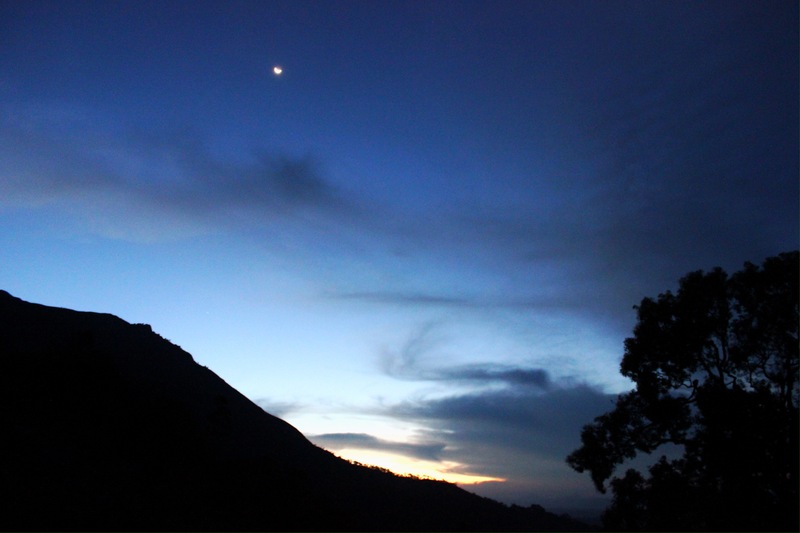 The rooms are massive, and the view over the valley is stunning – trees, fields, sunsets, tea, spices, children playing on the giant rock face shining off of the mountain next to your room. The only issue is the noise: the first night, screaming, banging, and slamming doors, which we were assured were just other drunk guests, not locals. The natural thing to do the next day is to take a tea trek through fields and mountains – all day, if you’re fit enough, and only part of the day if you’re an overweight, sullen Canadian man who feels the need to argue with everyone who doesn’t pay sufficient attention to him and his enchantingly captivating stories about working on a kibbutz in Israel some 30 years prior. 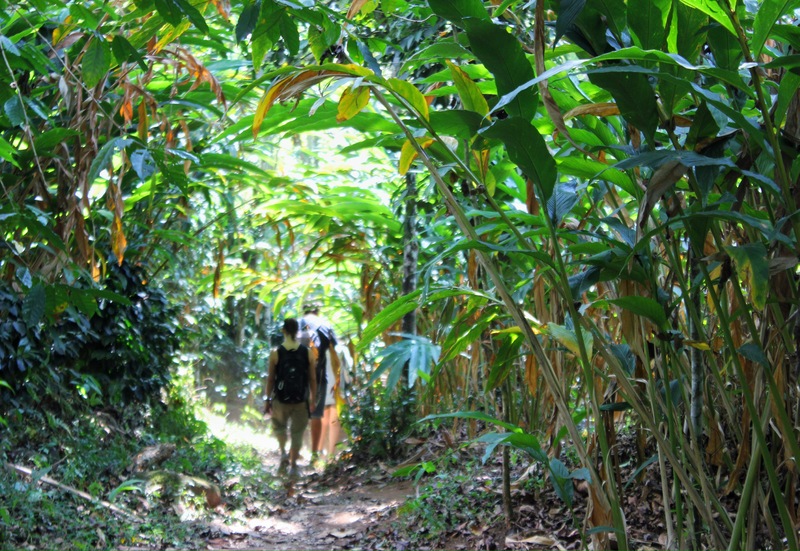 The trek starts out in the middle of town, climbs high into the hills above the fields, climbs even higher into scrubland, then descends into spice plantations. 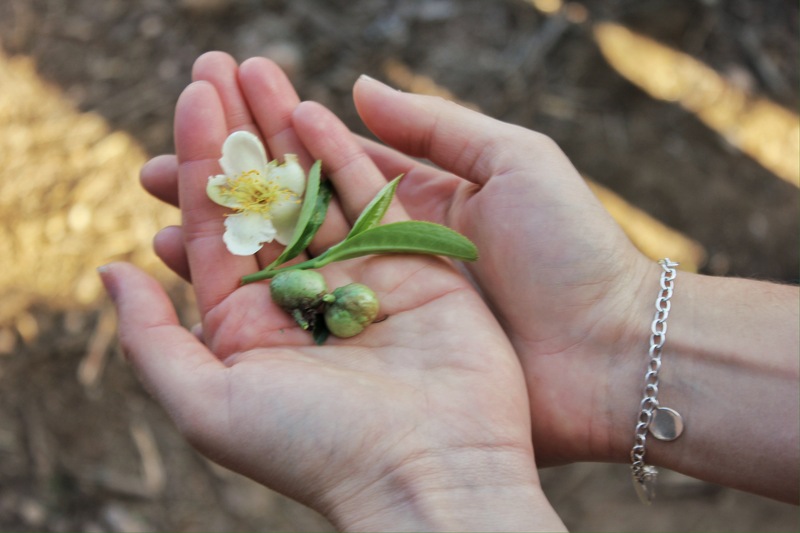 You realize that food is EVERYWHERE in India – virtually every bush is edible, or makes things more delicious, and you pick coffee, cardamom, pepper, fruit, chilis, cocoa, and probably 15 other things I have forgotten. 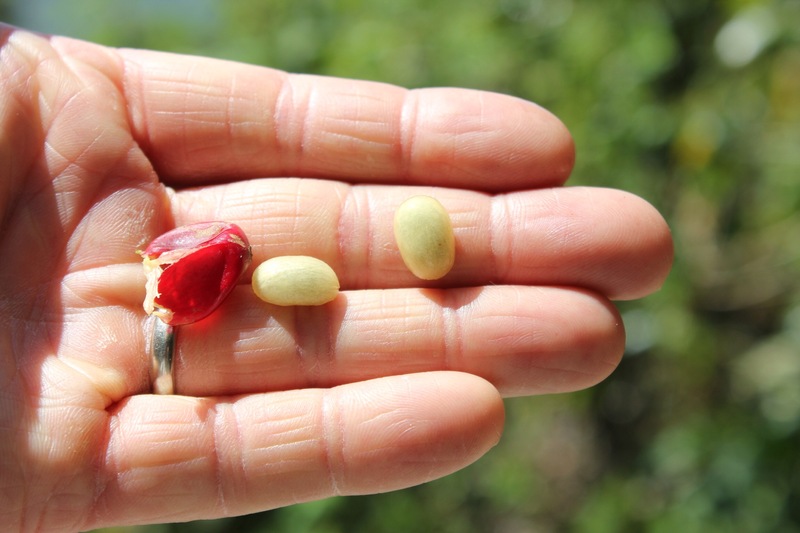 Then, when you think you’ve seen it all, the guide will pick up a bean. He will rub it quickly on a rock, and then touch it to the back of your hand, where it will feel as if he has slammed a searing hot poker into your flesh and twisted it around. He will do it to a few other people, but you’re the only one who thinks it’s really funny, so he gives you the bean as a souvenir. When asked, he confesses that it has no name. “Hot bean,” he calls it. 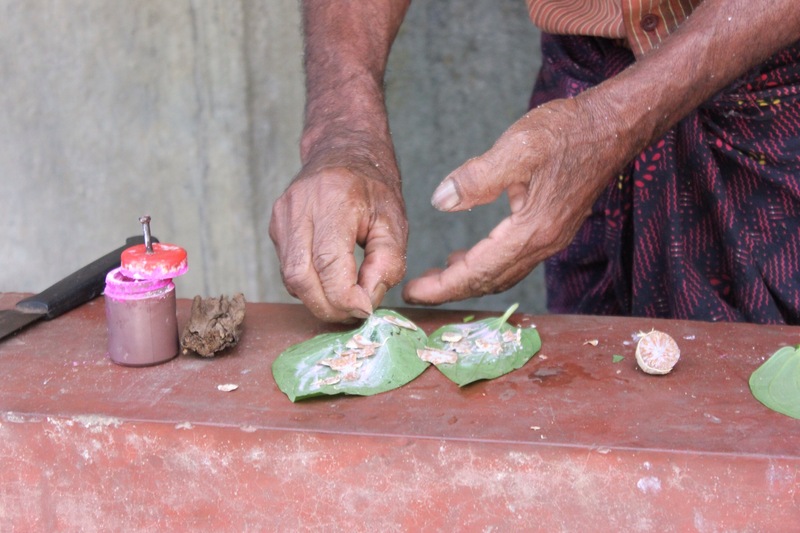 And betel nuts. In Siddhartha, by Hesse, the title character is described toward the end as being someone who people just instinctively trust and like, and want to share their secrets with, just because he seems to glow with a friendliness and warmth that comes from some internal peace. Toward the end of the walk, you see a hut on the right, and a man sitting outside of it, and the guide calls out hello to him. 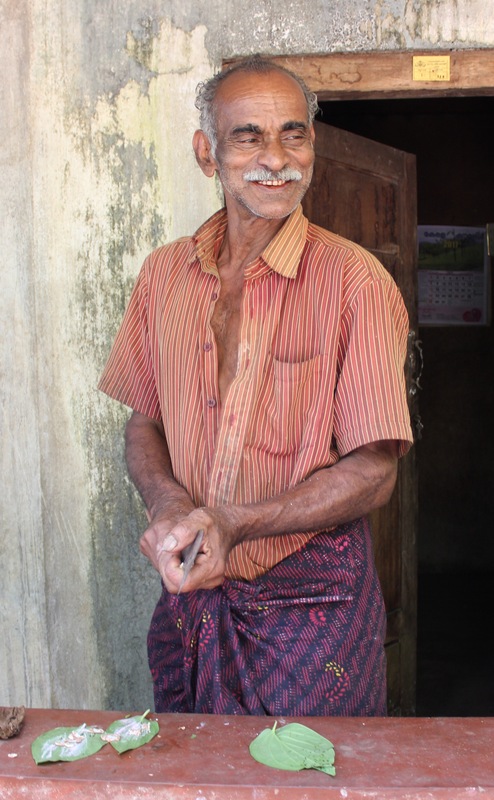 That man reminds you of that instantly-trusted Siddhartha; he is the local betel nut wholesaler, and, in the middle of the afternoon, he has nothing better to do than sit outside of his hut, greet the group of tourists who come by, and peel some fresh betel nuts for anyone who wants to chew. His smile, red-flecked so it looks like his gums are gushing blood, never leaves his face as he smears the leaves with lime, adds tobacco and nuts, and rolls it all into a pouch. You’re the first to hold out your hand; everyone else confesses to fear, but does it softly, under their breath, in case he understands more English than he lets on. Then Russ tries, then Becca, then the French man, and the Canadian looks disgusted with you all. 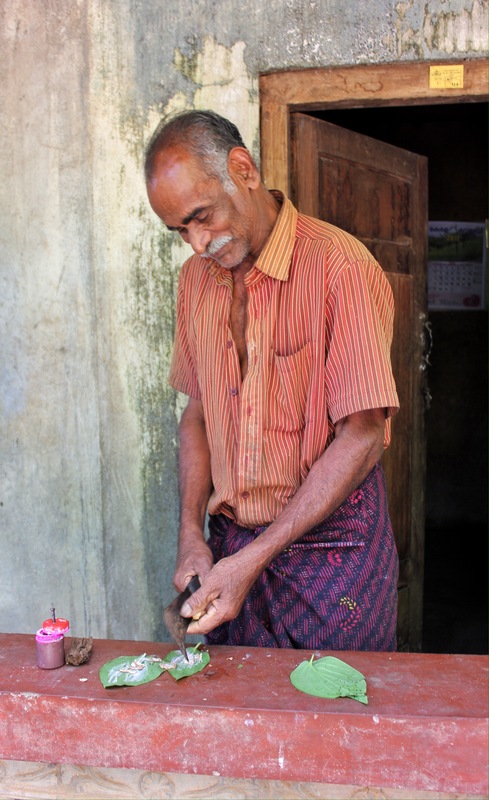 The betel-nut man is delighted with each person who tries them, not because he’s laughing at you, but because he’s sharing a joy he has found, and he loves when others join him in his joy, when he can share joy. Twice you try to pay, but he won’t have any of it; the smiles that you’ve exchanged with him are enough, and it’s like you and Montoya have shared the aficion for the bulls that Hemingway describes. When you walk away, you’re actually a bit sad that you’re leaving, and that you don’t speak enough of the local dialect to talk to him and hear his story. A few hundred meters down the road, everyone is still spitting and laughing except the Canadian, who shortly thereafter calls a tuk-tuk to take him back to his hotel. The last day, you go into town to wander. After ten minutes walking around a building, you find the post office and get stamps, then mail your postcards. You walk around the stalls in the street, smile at the people, buy a shirt, go back to Mohammed’s for lunch, then cross over the river to the temple, then cross back over toward town again over a different bridge. Turn right and you’ll find 100 meters of shops that then peter out into nothing; return, and you can enter the maze of arcades full of tailors. Keep turning and winding further into the tiny alleys, and wonder how many people need tailored clothes in order to keep all of these seamstresses in business. Emerge into the produce market, and realize that even though you feel like you’ve walked a few miles, you were just in a small building packed with entrepreneurs, and you have not even returned to the Gandhi statue yet. Call for a tuk-tuk, then get back to your hotel for sunset reading, dinner, and sleep. That was wonderful, Andrew! You took us there with you! I could see it, hear it, feel it and smell it. Thank you so very much for the journey! I’m lusting for photos!